Here are the top 10 food truck tips to get you started in treating your taste buds to a fast and delicious meal in the L.A. area. 1. Pick a type of cuisine to satisfy your taste buds. 2. Use the web to compare prices on food trucks. If you are on a limited budget, you may care about the price of the food that you purchase. Food trucks may be a great option for you due to the low cost food they have to offer. You should be aware that not all food trucks offer affordable dishes. 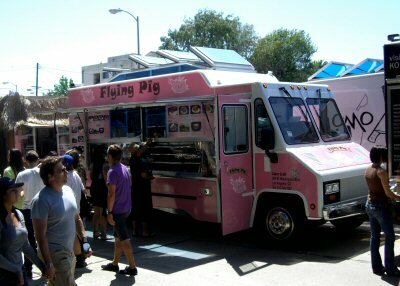 Gourmet, specialized or themed food trucks may actually charge a pretty penny for the dishes they have to offer. By checking the price range of food trucks ahead of time online, you can avoid a massive disappointment on your lunch hour. 3. Research the top-rated food trucks of L.A.
Before you visit a food truck, you may want to ensure that the food truck has received great reviews. Consumer reviews can indicate whether a food truck has thorough sanitation habits, offers tasty dishes or eliminates grease in its food. 4. Pay attention to any specials offered by a food truck. When you are ordering a dish from a food truck, you should pay attention to what other people order. A food truck may be renowned for a particular dish, and you can determine this by paying attention to whether food truck goers tend to order a certain dish. You can also check out online reviews to see whether they tend to discuss a particular food item. 5. Make sure you tip food truck operators. Food truck operators work hard to prepare food for patrons. They may operate a food truck as a non-profit entity and donate proceeds to charities in the community or other good causes. By paying it forward with a tip, you show your good will to a food truck operator and also develop a strong relationship with him or her. The food truck operator may be willing to let you cut a line ahead of time or order via text if you give a great tip. 6. Share your thoughts about a food truck on social media. Tweeting about a food truck or creating a blog post can have a tremendous impact on the popularity of a food truck. Food truck operators will be incredibly grateful for any positive reviews that you can share about a food truck on the Internet. Even sharing a quick picture on Instagram can quickly boost the patronage of a food truck in L.A.
7. Download the food truck’s schedule ahead of time. 8. Give in to your dessert cravings. If you try to diet all the time, you will miss out on the amazing dessert trucks of L.A. Indulge yourself every now and then for a gooey chocolate cookie or gourmet ice cream cone. Food trucks can attract a diverse group of people. You may meet polished professionals, art lovers, foodies or college kids in town. Be ready to make some great friends and perhaps enjoy some conversation while in line. 10. Get in line as soon as possible. Make sure that you visit a food truck as soon as you can. Food trucks usually have a limited supply of food. Get in line ahead of time so that you don’t have to fight for leftovers. If you have a favourite food truck in LA that you would like to have added to our list please do get in touch and we will add them right away. Now get out there and enjoy your lunchtime! This entry was posted on Tuesday, November 9th, 2010 at 11:39 am	and is filed under Office Talk. You can follow any responses to this entry through the RSS 2.0 feed. You can leave a response, or trackback from your own site.